Freelance investigator Mike Ironwood doesn’t hesitate for a moment when a lovely stranger asks him to help her get to the bottom of suspicious happenings on her family cattle ranch. The case is intriguing, and Willimina even more so. Six days in, the case has turned up two dead bodies, an alphabet soup of secretive federal investigators, and a client who just might be The One. That’s when things get complicated. When a greedy DEA agent and his complicated and deadly triggerman kidnap Willy, Mike enlists help from his brother and sets out to rescue her from a conflicted cartel jefe. The trail leads them deep into Mexico, but they come home with dangerous unfinished business. 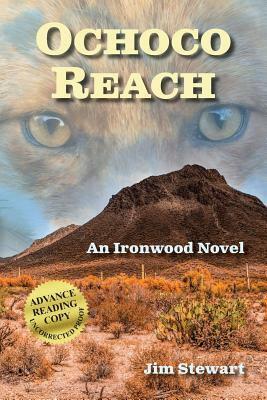 Ochoco Reach introduces Mike Ironwood, his special ops brother Daniel, and Bucket, a Catahoula leopard dog who is equally at home herding cattle and pinning bad guys to the floor. Together, they are formidable allies who also seem to attract trouble at every turn. When I was a kid, I love a series called Hank The Cowdog by John R. Erickson. This series was about a loveable cowdog named Hank who sees himself as Head of Ranch Security. The series follows Hank as he solves crime and catches bad guys all while getting himself in hot water over and over again, to hilarious results. This reminds me that I used to do series feature…I probably should do this one. It’s truly one of the greatest series for kids out there. Mike Ironwood reminds me of a human adult version of Hank. Not because he’s in any way hapless, but his personality is very much like Hank. I received this book in exchange for an honest and at first I wasn’t sure what to think, though I ended up really liking this book. I initially picked it up because of its Western Overtures and because Mike’s dog is a Catahoula Leopard Dog. I have a Catahoula-Lab mix myself. Bucket was one of my favorite characters, too. Ochoco Reach was fast-paced with tons of twists and turns. Mike Ironwood is an ex-solider and his brother Daniel, is Special Ops Native American. The bad guys were really no match for these two. In fact, all of the characters have great personalities! I’ll definitely be looking for more Ironwood novels starring Mike, Willy, and Bucket!